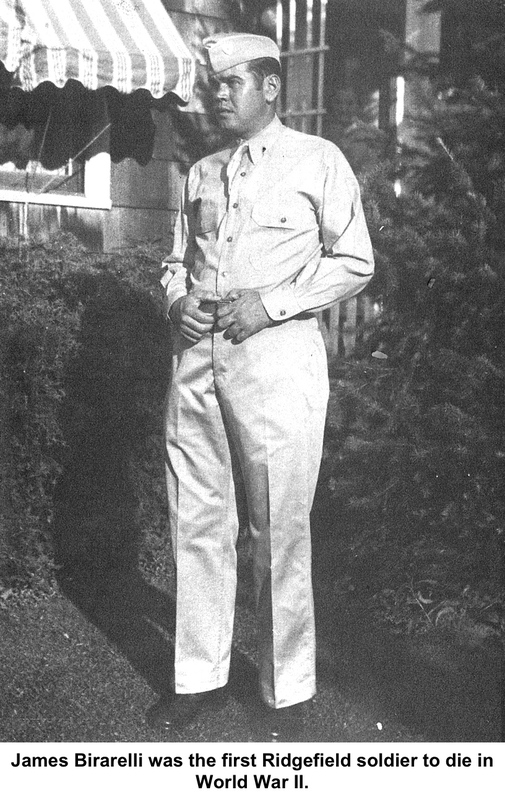 At least 20 Ridgefielders died in World War II, Ridgefield’s costliest war in terms of deaths of any fought during the town’s three centuries. 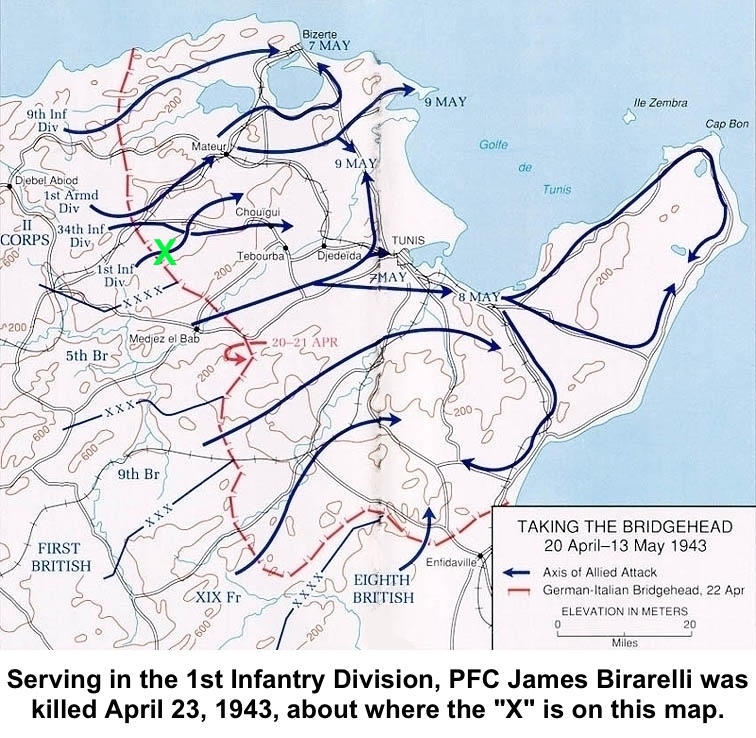 The first to die in combat was James Birarelli, shot as Allied troops were in the process of defeating the Axis in Tunisia. His father, 4,300 miles away in Ridgefield, knew something bad had happened. 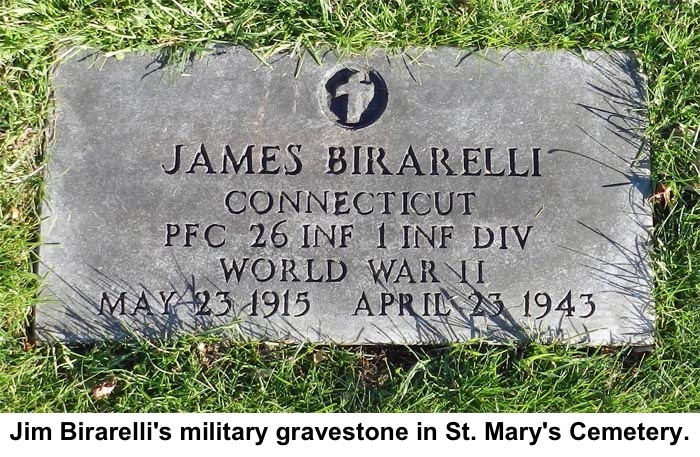 James Birarelli was born in Ridgefield in 1915, a son of Nazzareno “Nano” and Palmina Goffi Birarelli, who had immigrated from Ostra, Italy, in 1906. 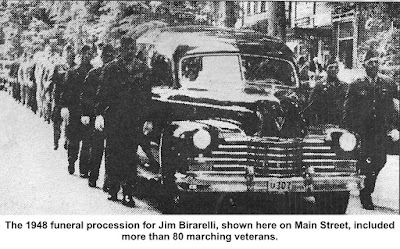 Known to his friends as “Jim Bar,” he attended Ridgefield schools, was a member of the Ridgefield Volunteer Fire Department, and had been working for a local nursery when he decided to enlist. He had just turned 25 when he entered the Army in March 1940, shortly after war had broken out in Europe, but long before the United States joined the conflict. The fighting was fierce — it took the 1st, 4th and 78th Infantry Divisions eight days to move six miles into the Axis lines. But by the first week in May, the Axis forces surrendered, and the Allies wound up with 230,000 German and Italian prisoners of war. 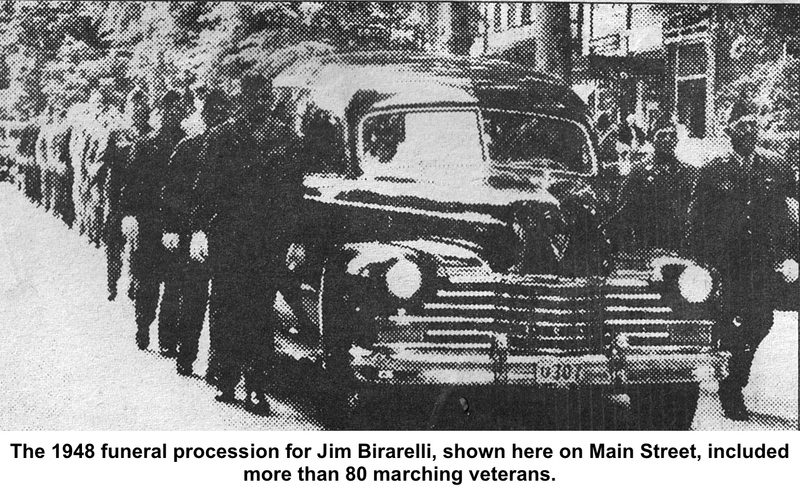 On the morning of April 23, the day Jim Birarelli died, his father had a dream, according to “Impact,” Aldo Biagiotti’s history of Ridgefield’s Italian community. His daughters, Mary (later Mary Morrow) and Nell (Nell Fortin), discounted the dream. on April 23, which was Good Friday. “Father was right,” Mary Birarelli exclaimed. When she heard the news, Palmina, Jim’s mother, “bolted hysterically from the house,” Biagiotti reported. 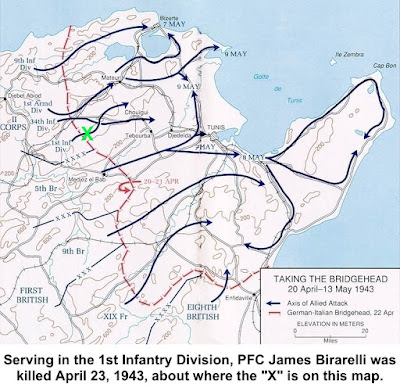 For his bravery PFC Birarelli was posthumously given the Silver Star, awarded for gallantry in action, as well as the Purple Heart. of 1947, the Army notified the Birarellis that they needed to move their son’s body from the cemetery in Africa to a national or civilian cemetery in the United States. Nano and Palmina decided to have their son buried in St. Mary’s Cemetery. The body did not arrive until the spring of 1948. Hundreds of Ridgefielders packed St. Mary’s Church Friday, June 4, for a memorial Mass celebrated by the Rev. 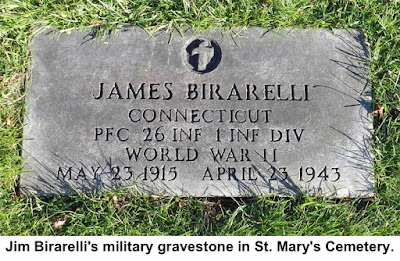 Dionisi J. Birarelli, Jim’s brother. More than 80 Ridgefield veterans marched with the hearse on the journey from the church to the cemetery.